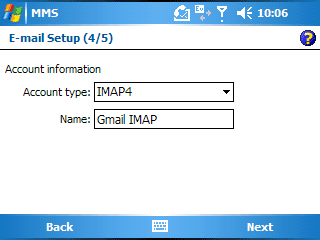 Today Google released an IMAP interface to Gmail. 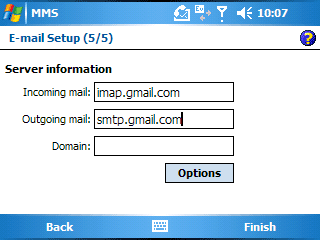 Once you enable IMAP via Settings in your Gmail account, you then need to configure your client to access Gmail via the new IMAP interface. 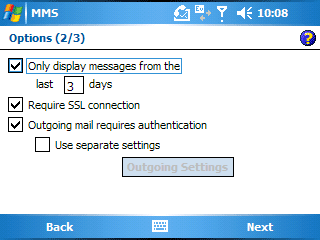 Since I’ve never been able to figure out how to get the Gmail for mobile application to run on my Windows Pocket PC (because I can’t find a J2ME Java client), adding IMAP now gives me the ability to ditch their Gmail for mobile browser interface and instead use the built-in Messaging client on my phone, which is also known as Outlook Mobile. 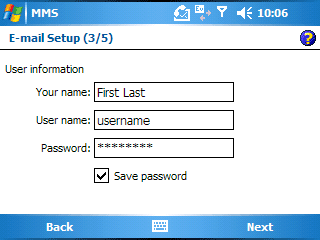 And since Google’s Help Center on the “Supported IMAP Client List” didn’t include instructions on how to set up a Windows Mobile Pocket PC, I thought I’d create a brief tutorial. 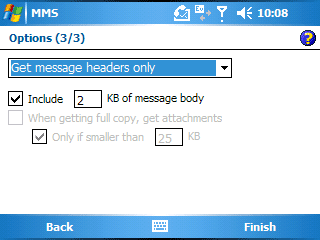 All steps are made within the Messaging client (Start > Messaging). Jason, I found the instruction by Google. It’s not under their ‘supported client list’ but it is under ‘Configuring your client’ Yours have all the nice screen shots though. These instructions worked like a charm for me. Thanks for putting this together! I seem to have a problem setting up my Pocket Outlook client. I followed your directions and see all mail in my inbox. However, if I switch to a folder under the inbox, no mail is found there. If I open up Gmail.com or Thunderbird, the mail is there. Any thoughts? Jeremy, I have the same problem/experience. Emails that reside in my Gmail Inbox are available, but emails in other Gmail folders (sent, drafts, outbox, etc.) do not appear on my Pocket PC via the Gmail IMAP protocol. I’m also having some problems viewing HTML formatted emails via the Gmail IMAP protocol. 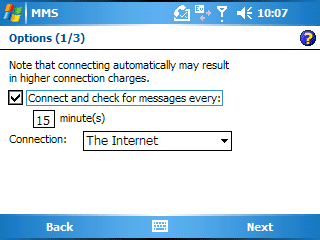 The plain text messages come through just fine, while other messages appear to have no content in the body. At least I know there are messages waiting for me, which can still be accessed via the Pocket PC browser at http://m.gmail.com/, which tends to show all email content and folders. I found out what our “problem” was : I too was seeing the gmail folder structure but not a single mail. The problem is that I hadn’t use gmail for a while and the “only display messages form the last  days” was checked by default. Everything seems to work for me here but there is no content in the messages I receive. I get the headers and the attachments but the message body is blank. still only have blank body for html messages. any ideas? HELP! 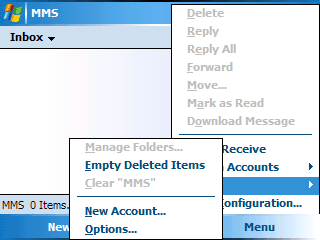 If you go to Menu > Tools > Manage Folders on your pocket PC, you can select the folder you want to download on your mobile device. 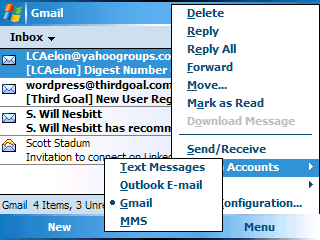 On January 29, 2008, “Google Fixes Gmail IMAP Problem on Windows Mobile.” Basically, they fixed the problem that caused Windows Mobile phone users to receive blank Gmail messages. The screen-shot tutorial I wrote above still applies, only now your HTML-formatted emails will also work. 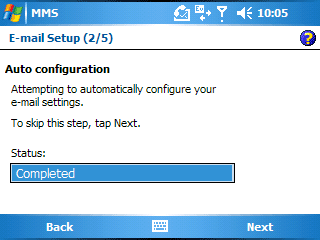 If you want to read Google’s text-only tutorial on how to configure IMAP on Windows Mobile, here’s the content in their Help Center. 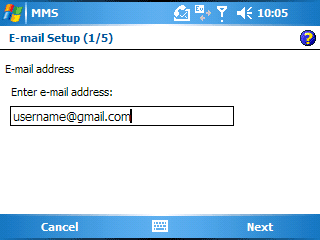 gmail to pocket pc: i followed all instructions but when i go to log on, my pocket pc aborts the log on and dumps me back to the account name and password box…any ideas? WOW! I’ve been struggling with that for months! Glad to finally be able to read auto-labeled emails! Awesome! No more disappearing messages after a Send/Receive. Much better than pop3. Yay! Thanks for posting this Jason! Most clear instructions I found anywhere. For completeness, might want to add a a quick note at the top reminding users to enable IMAP in their GMail settings. So I have my email setup and synced on my mobile device (its actually google apps gmail, so setup was just slightly different). I can recieve emails fine, but when i try to send it tells me to check my account settings. Any suggestions?